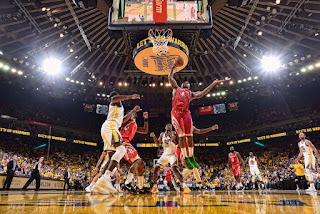 The Houston Rockets were up 17 on the Golden State Warriors and poised to steal another in Oracle Arena to close out the series. 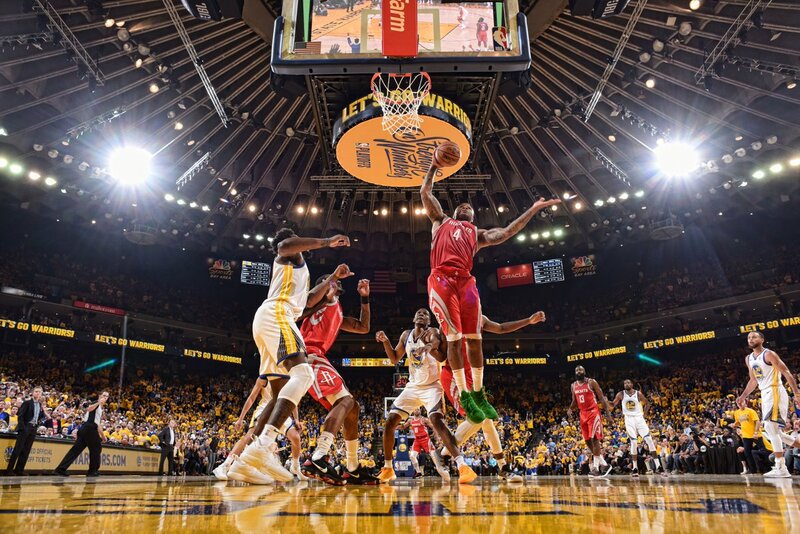 The Houston Rockets were up 10 on the Golden State Warriors and remained slightly less poised to steal a game in Oracle Arena to close out the series. The Houston Rockets lost the game by 29 points. The series will reconvene in game 7 in Houston on Monday. There is, of course, more context. The biggest piece of context was that Chris Paul sat the game out with a hamstring strain. His input was clearly missed as Houston's offense entirely cratered in the second half. They sort of survived the third quarter, down a mere 7 going into the final frame. They then lost by 22 in that quarter alone. They scored 9 points in the fourth, and 5 of them were in garbage time. That game was winnable for a very long time, but eventually the guards wore down and the Warriors made some shots. The Rockets tend to rely on driving the rim to punish overplay on the perimeter, but they weren't able to get the calls they needed to to make that a credible threat. Without Paul's sublime mid-range game, there was little they could do as they ran down and eventually sputtered out. Harden had 32 points on 10-24 shooting to go with 7 rebounds, 9 assists, 3 steals and 9 turnovers. This looked an awful lot like a game from the last couple years, games in which he has to move mountains by himself. Against most teams in the league, this may have been enough. Against the Warriors, it was insufficient. Would that game have gone differently if they had pushed a little harder, made a couple more shots to push it to 20? If they had gotten more of the calls they wanted and been able to stop the bleeding? If Paul was there to steady the ship? There's no way to know. And, at this point, it doesn't matter. The Rockets just suffered a massive gut punch, and must get angry and recover for game 7. They will take their own court, in front of their own fans, with a chance to win once basketball game to go to the NBA Finals. Nobody knows what will happen, but we know everyone will watch.